For berry growers in the Southeast, an alternative trellis system might prove to be a useful tool for improving blackberry production. 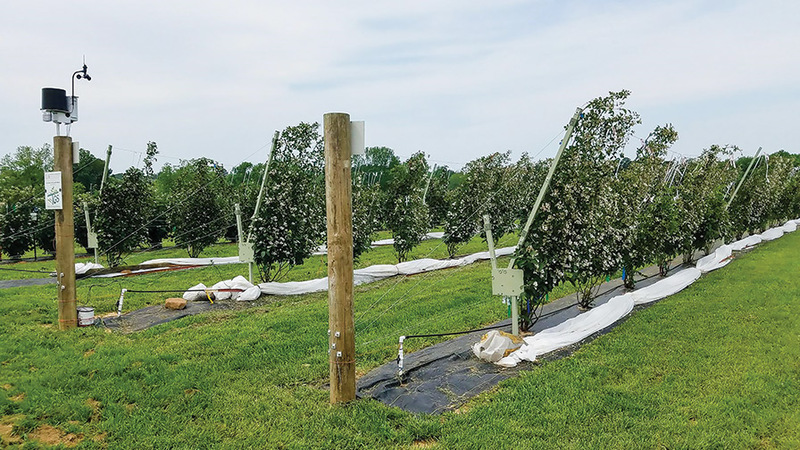 Researchers are evaluating the rotating cross-arm (RCA) trellis system for its potential benefits as compared with a standard T-trellis system. 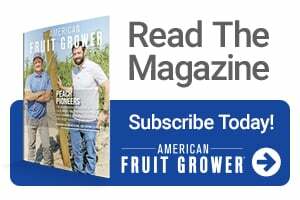 While growers in colder climates typically use the RCA trellis system to winterize their berries, some growers in the Southeast are finding that using the system can benefit their operations as well. Researchers at the University of Arkansas System Division of Agriculture’s Fruit Research Station are looking into how the use of the RCA trellis system can improve blackberry production in the region. Extension Horticulture Crop Specialist Amanda McWhirt is studying the effects on fruit yield and quality. In addition, she has worked with growers in the Southeast who are using the system and has been able to observe its potential benefits for improving yields and fruit quality as well as protecting berries from high heat. Unlike a traditional static trellis on which berries grow vertically, the RCA trellis provides a near-horizontal platform that can rotate 180 degrees. The trellis system was designed by Fumiomi Takeda at the ARS Appalachian Fruit Research Station in Kearneysville, WV. It features a vertical post and a long, rotating cross-arm at the top. Blackberry canes are attached to the trellis and positioned to allow the plants to receive proper light and rainfall. With this system, primocanes are trained to grow horizontally and are tipped when the canes reach the next plant. These tipped canes produce lateral canes, which are tied to wires on the long cross arms of the system. In the winter, the rows can be rotated down with the tips of the long cross arms resting on the ground. In the spring, new leaves and flower shoots grow upward toward the light. When the flower buds begin opening, the trellis is rotated to a vertical position. The fruit develops on just one side of the trellis, which can be positioned to protect the fruit from direct sunlight. The RCA trellis is currently commercially available. It is sold through a limited number of manufacturer-retailers, such as Trellis Growing Systems and Atlas Greenhouse Systems. McWhirt and her team are using three Arkansas-developed blackberry cultivars and collecting data on fruit yields, flavor characteristics, quality in post-harvest, and pest and disease pressure. In addition, the team is keeping track of the number of hours spent managing the two different systems — RCA and standard T-trellis — in order to evaluate the amount of time spent training the canes and harvesting with each trellising method. The goal is to determine how the blackberry cultivars perform, and how the performances differ between the two types of trellising systems. “Ultimately, we hope to use this data on crop production and combine it with our logs of how many hours are spent managing the two different trellising systems to evaluate the economics of investing in a rotating trellis system,” says McWhirt. Hard data on the research project is not yet available. However, McWhirt says she has worked with some growers in the region who are using the RCA trellis system and sees real potential for using it in the South. It has been her observation that use of the training system is resulting in increased yields for some growers, she said. McWhirt says the RCA trellis system is not currently in wide use across the Southeast, but she has observed a range of growers using it, including both large commercial growers and smaller, pick-your-own operations. “I find this interesting because these growers have very different marketing strategies and customers, but both seem to have found the trellising system to improve their production systems,” says McWhirt. In addition, the training system also may be helpful in dealing with late-spring frosts and high heat — both of which create limitations for blackberry production in the Southeast. In the spring, the trellis can be laid down with a row cover placed over the plants, explains McWhirt. It also has potential to prevent or reduce heat-related disorders on blackberry fruit. The trellis can be positioned in an east-west orientation so that the berries are on the north side, which can help reduce the temperature in the canopy by 8-10 degrees. “Ultimately, the thinking is that white and red drupelet disorders are the result of high temperatures and direct contact of sunlight with the berries. If we can remove or reduce these factors, this may lead to better fruit quality on the rotating trellising system,” McWhirt says. The research team will be looking at differences in berry temperature throughout the day between the two trellising systems to see if this results in measurable differences in heat-related disorders and postharvest quality. 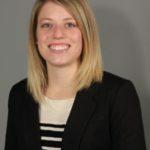 Amanda Gallagher is a former associate editor for Greenhouse Grower® magazine, a Meister Media Worldwide publication, and current freelance writer in Philadelphia, PA. See all author stories here.